A cochlear implant is a device that electrically stimulates the auditory nerve of patients with severe to profound hearing loss to provide them with sound information. There are two parts to a cochlear implant: the external and the internal. External Sound Processor: This piece sits behind and over the ear with an earhook and looks similar to a traditional behind-the ear-hearing aid. The microphones capture, filter, and process sound and then translate the sound into digital information. The digital information is sent through the external transmitting coil. External transmitting coil: The translated sound gets sent through the external transmitting coil which then, via an FM signal, transmits across the skin with a magnet. The internal implant converts the digital information into electrical signals and sends them to tiny electrodes inside the cochlea (inner ear). Electrode array: The electrode array receives the electrical signals and stimulates the auditory nerve (hearing nerve). The cochlear implant takes the place of hair cells (cells inside the inner ear that stimulate the auditory nerve) to electrically stimulate the auditory nerve. The auditory nerve receives the stimulation and sends the information to the brain, producing a hearing sensation. The goal of all cochlear implants is to electrically encode speech in a manner in which it will be understood in a variety of listening environments. 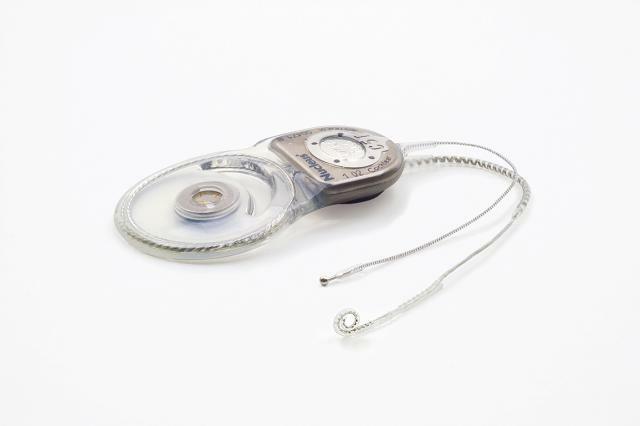 Each cochlear implant manufacturer utilizes different speech-coding strategies. Speech-coding strategies are a set of rules used to convert acoustic signals into electrical stimulation. The objective is to convey high-fidelity electrical representation of the incoming sound, thereby allowing the cochlear implant user to perceive sound in a similar way to a normal hearing listener, even with a severe and/or profound hearing loss. A cochlear implant considers all three dimensions or acoustic characteristics of sound when utilizing sound-coding strategies: intensity/amplitude (loudness), frequency (spectral/pitch), and temporal (time). The frequency is conveyed by the site of stimulation in the cochlea. In other words, it pertains to the specific electrodes along the array in the cochlea that are being stimulated. The amplitude is conveyed by the different amounts of stimulation, or current levels, the electrodes receive. Finally, the timing cues are conveyed by the rate, or how quickly the electrodes are being stimulated, and the pattern of the stimulation. It does not matter what your age or IQ is, whether you were born deaf or became deaf later in life, if you have other disabilities, or if you have not worn hearing aids, you may still benefit from a cochlear implant. If it was previously determined that you were not a candidate and your hearing difficulties have increased, revisit your audiologist. Using a cochlear implant is a whole new way of hearing sound. Therefore, it may take days, weeks, months, or years to be considered a successful user. It is important to speak with your audiologist about proper expectations. These expectations are considered different for every person. What is the Protocol associated with Receiving a Cochlear Implant? Clinical protocols vary from clinic to clinic, though there are some general protocols that are shared among the hearing health professional community. A cochlear implant candidate will need to meet the requirements by undergoing a medical evaluation (including a general health assessment and imaging (e.g. CT, MRI) and a full audiological evaluation (hearing profile) with and without appropriately fit hearing aids. Additionally, the candidate must meet all FDA requirements to be considered. The candidate and family/friends of the candidate must undergo extensive counseling on appropriate expectations and be educated on the cochlear implant process, such as the need for frequent follow-ups with the audiologist. Further, they should be educated on what a cochlear implant is, how it looks, and how it works. Above all, the patient needs to have a desire to be part of the hearing world.